Kimchi is tasty and healthy. I made some to fill up a whole bucket the other day. Then I can take some out as an appetizer for my daily meal. It’s very handy. Well, sometimes you want something different like me. 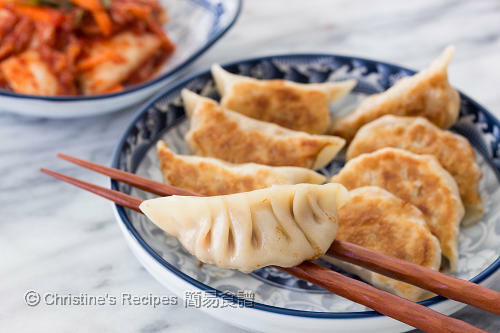 How about making some dumplings with these delicious kimchi? I made some more uncooked dumplings and store in freezer just in case I crave for some during breakfast, lunch or even afternoon tea. 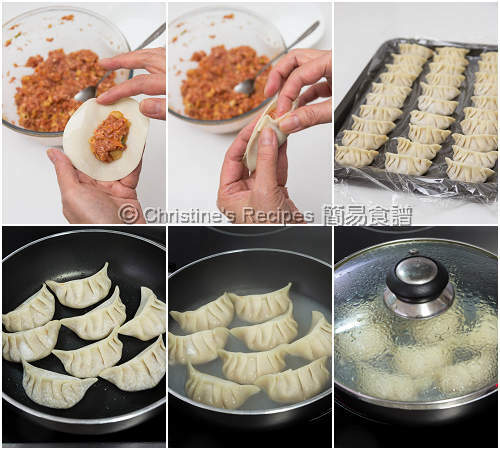 If you have more time, do try making your own dumpling wrappers. It'll take your dumplings up a lever for sure. Put on plastic gloves and squeeze the moist out from the kimchi. Finely chop. Set aside. 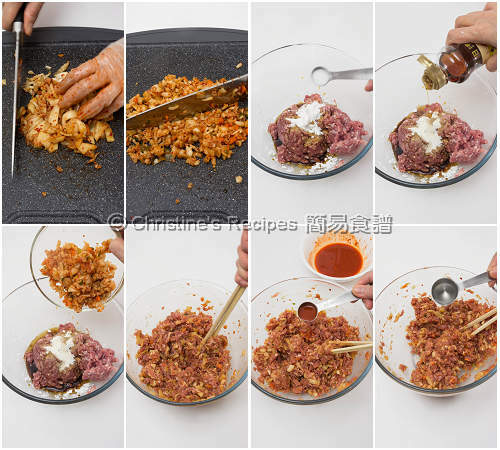 Combine the pork mince, kimchi and the marinade well. Use a pair of chop sticks or your hand to stir towards one direction until the mixture is elastic. Gradually add the kimchi juice and water bit by bit until the moist is well absorbed. Chill the filling for 30 minutes. Wrap a heaped spoon of filling with a dumpling wrapper. Repeat this step to wrap the remaining fillings. Please refer to this video, “How To Wrap a Dumpling”. Heat oil in a non-stick frying pan over medium-high heat. Place the dumplings in one single layer without touching each other. Cook until the dumpling bottoms are brown. Pour in ¼ cups of boiling water. Cover and cook until the water is dried up. Sprinkle a few drops of sesame oil if desired. Served hot. By stirring in as much water as possible, the pork mince filling won’t be dried or tough. If you’re into more spicy, hot taste, you may add more kimchi sauce instead. Or replace the kimchi sauce with water if you don’t like them hot. It’s better to wear plastic gloves while cutting kimchi. 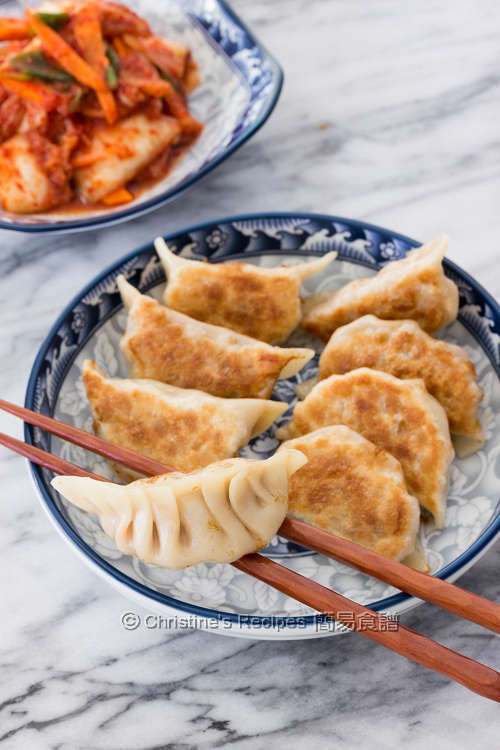 About storing uncooked dumplings in freezer: Put them in a single layer on a lined pan. When they are hardened, you can transfer them in a plastic freezer bag. They can be kept in freezer for up to 2 months. When you crave from some, just cook them on a heated pan followed the above instructions. No need to thaw them in advance. It only takes 10 minutes more of cooking time. 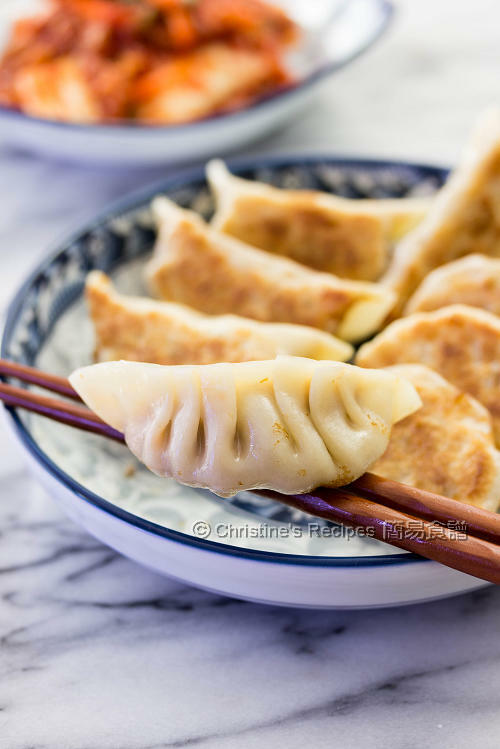 I love dumplings and it's about time to make a batch myself too. Yours look mouthwatering. Thank you Christine for another FABULOUS recipe. i followed your recipe exactly and thought the filling was going to be a bit bland with only 1 1/2tbsp of soy sauce but it was actually perfect. Sooooo delicious!! The kimchi is salty already so we can add less soy sauce. Glad that you loved this recipe. Thanks for taking time to leave message. Am so happy too.